Once upon a time, Cadillacs were driven by everybody who was somebody. Al Capone, Frank Sinatra, Marylin Monroe, Elvis Presley. Cadillac was the gold standard of luxury, and people from all walks of life aspired to own one. Decades of corporate apathy led to a decline in the brand appeal, but the Cadillac CTS was instrumental in reversing this trend. 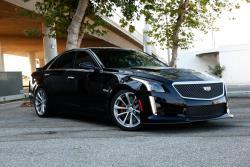 By the 2014 model year, the 3rd generation CTS was finally being mentioned in the same breath as Audi and Lexus. In order to cleave business from the BMW 3-Series segment, they introduced the compact Cadillac ATS, which was an immediate success. In the performance department, the entry level 2013-2016 Cadillac ATS 2.5L puts out a healthy 202-hp, the turbocharged 2013-2016 Cadillac ATS 2.0T dumps 272-hp onto the rear wheels, and the top-spec 2013-2016 Cadillac ATS 3.6L delivers 321-335 horsepower. The 2013-2016 Cadillac CTS offers nearly identical performance, but with slightly more interior room. And now you can increase airflow into both cars without voiding the factory warranty, thanks to the AIRAID 850-496 direct fit replacement air filter. No matter which engine is in your Cadillac CTS or Cadillac ATS, power gets made the same way: air comes in through the air box, flows down the intake tube, get sucked into the cylinders where it mixes with the fuel before getting burned into horsepower. 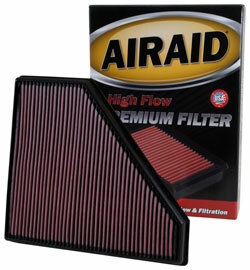 If you want to get more air into the cylinders, then all you have to do is replace the stock paper air filter with a high flow performance air filter from AIRAID. That OE Cadillac air filter uses a ‘surface loading’ design, which means the dirt that it removes from the air, gets trapped on the surface of the filter. Over time, all of that dirt builds up, reducing the amount of air that can reach the motor, and subsequently the amount of power it can make. An AIRAID 850-496 direct fit replacement air filter, on the other hand, uses a ‘depth loading’ design, which means dirt gets trapped inside of the filter itself. Each one is made by sandwiching multiple layers of cotton gauze and synthetic material, which is then treated with a proprietary oil. This causes the cotton and synthetic fibers to form a sticky web that can trap even the tiniest dirt particles, and lock them in place for 30,000-50,000 miles. That oil then soaks into the dirt, causing it to become a filtration element and stop even more dirt from reaching the engine. Thanks to this unique design, more airflow is allowed through the filter. Another benefit of these Cadillac performance air filters is increased engine protection in dusty or dirt filled environments. You’ll also save money, because each 50-state legal AIRAID 850-496 replacement air filter is reusable, and is backed by a No-Hassle Lifetime Warranty. So if you're ready for a drop in performance upgrade for your 2013–2016 Cadillac CTS, or 2013–2016 Cadillac ATS, then pickup an AIRAID replacement air filter today.